Not long after we returned home there was a need to pick up a new mattress for our single guest bed. Weston was the only one available to go in with me to town and I think it must have been his first visit to a furniture store. Thereby, he was unprepared for the inviting layouts of living room furniture throughout the luxurious space. He was drawn to a sectional couch and asked if he could sit on it. I said yes. After we picked out our mattress, he had found another bigger, softer couch that he was pretty sure we needed. And would you believe that there was a sale that day? (Of course you would, but to us it seemed Providential). The super sale was for that day only (a Thursday of all things) and if we wanted the slashed price, we had until 5:30pm to purchase. --As we had guests coming in 2 days, everything seemed urgent. The cost, a cautious Daddy, and the fact that we already had two sofas filling up our relatively small living room seemed large obstacles to me, but I saw a engaged determinism in Weston that had started with his enlarged view of life in Oregon and I wasn't going to squash him. I agreed that he could mention it to Daddy once we got back home, but my faith was small. An hour later, the boys have gone to another movie meeting meeting and I can see that David is on the hook. Do we need this couch? Do we want this couch? Not easy to see how right now. ...And then we start talking about Weston, about our values, about making this year livable and life-giving for us... now. Lately we have totally been eating supper in our living room instead of at the kitchen table. This is so we can watch instalments of great stories together on the big screen. We call it picnic, and the food always tastes better when consumed in this way. A new large mocha chennielle sectional would be quite conducive to family snugglement, even if it seems indulgent. 1. Weston and I help carry one of our couches OUT THE WINDOW and on to Kyla's pad for its new home. 2. Hadden and Dave and the boys hoist our other couch, the faux leather torn beast, out same said window (poor trampled flowers the only cost) and there it sits on our lawn, hoping to be adopted before going to the dump. 3. And lo and behold, instead of waiting until the middle of the next week for a $100 delivery, David finds a truck to borrow, trots off to Drumheller, loads both sections of our new large couch and he and the boys set it up in our living room. It takes up a lot of space, but is very inviting. And new. So pristine that I find myself quickly picking off any lint or spec that lands on or near it. 4. The next morning we seem to be in attack mode with our house. Things that have sat, unseen, for months are suddenly being dealt with. Sheets come off beds, right down to the mattress cover, and get a thorough cleaning. Even the mattress gets flipped and turned and the frame moved for overdue vacuuming. The boys are weary after 90 minutes straight of purging and cleaning, and David is on fire and could easitly go another 3 hours if he had the time. We talk, and the boys are let off the hook for the day, but we speak of asserting a habit of Saturday morning cleaning and organizing and downsizing for the future. We'll see if it sticks, but I believe it will have more traction than pressing through with huge spuratic overhauls. is that the new couch was the thing -- the catalyst to engaging the tasks that were waiting to be acted upon. Suddenly having something nice and new in our home made us want to sharpen up our space and make the rest of it nice as well. It raised a standard of living that we hadn't aspired to, or thought was possible. And it wasn't a gift and it wasn't particularly a need... and yet it became such a stimulus for new productivity, that now I can't imagine life without it. All the "slow-drip" advice I have been absorbing in my "year to clear" course came into force with the initiation of a change. And we went into action. It was revitalizing. I can't wait for you to come visit and sit on our lovely new couch. But even more, I am praying for the fortitude to continue with more life-giving action from this inspiration. I hadn't foreseen that the indulgence of providing something special and costly would spur on a new pride of ownership and a shedding of old things that were holding us back. I'm cautious and excited about what will happen next. "Come on Mom, don't you see how important this is?" Amazing how time has moved quickly for me this last month. After the boys movie premiere on the 15th of July, Weston and I took off for Oregon for a week. Travelling so soon after the big event felt sudden and out of sync with the rhythms of our small family, but we (I) was determined. Once we got to the old home state and were greeted by Mom and Dad, Rosebud inevitably began to fade from what was right in front of us. It's like I shed a layer of skin and was able to absorb the old familiar again. The trees, upon trees, upon trees. The low altitude air. The blue rivers and rounded hills. The Gravenstein apple tree. The nutria, ducks and geese. The flowers. And the comfort of mom's food and their immaculate home. It was warm, but air conditioning was always near. It was great to walk with Mom in the cool mornings, and Weston enjoyed having his own space with a large bed to sprall on. I was most concerned about him before leaving. He so did not want to go and miss out on his next movie making venture. Thankfully, he was a great help through the airports when I was especially tired from the early early morning and not being able to get much sleep the night before. One of the things he was dreading happened early in our stay. We visited a couple schools. When we pulled up to the first place, I prayed for grace and wisdom to handle the newness and awkwardness and hardly dared to hope for much more than mild disinterest. We were met by the new principle, Ami, and she was fun. She was smart and bright and not pushy at all. Her eagerness stemmed from a pride in her school and she was tuned to anything we were interested in. She showed us several rooms and a few different buildings, and as she began to speak about curriculum, both of us got more curious. After a while we all sat down at a table in her office and I watched my son engage. He had his own questions, and she (bless her heart) treated him with respect and interest as an equal -- never going through me or reacting to his statements, but taking him seriously and without expectation. I saw him feel valued. And I saw a light go on inside. An excitement in possibility and freedom. School for Weston has most often been something to endure and get through as quickly as possible, but now here was something unexpected. Ami spoke of avenues where one could combine their interests with their education. Mind blowing. It was such a gift. It was like a window opened and some light poured in. More than I had even dared to pray for. Much of our other time was spent with family and eating amazing food and always ending the night with ice cream and Poldark. Mom introduced us to the series and we were hooked from the start: Weston snuggled in a super soft overly large blanket, and Mom with the remote. I was so happy for this regulating practice we could share together. Dad was in his office working on his next class or editing old family movies. Weston and I also got to go in the hot tub, see the Mariota sports center, visit Dorris Ranch, take in a free jazz concert downtown, get some new shoes he loved, and help with meals in the big kitchen. We also attended an afternoon service with the congregation David and I used to attend called Reformation Fellowship. It was mild and longer than what we were used to, but I appreciated getting to see some familiar faces and ask for prayer in our family's time of discernment. Visiting with friends and family was a gift. When we are often so far away we miss out on little things. Listening to Weston engage with his future cousin-in-law and uncle Randy to mock the commentators during the rugby world cup was a strikingly humorous time. We also played pinocle and visited a few open houses. Weston remarked that he came into himself a bit with his extended family. That, without his older brother there to speak first and take up some of the attention, it was easier for him to assert his own voice into the conversation. He entered another world and began to see possibilities there. I was so full of thoughts and agenda, that I no longer blogged. I didn't desire to really. I even forgot a few times to read my daily lesson. Ha. I was surrounded with stimulus and people I rarely get to see, and Mom was now feeding many more than normal so there was always something helpful that could be done in the kitchen. One day Weston and I arranged several vases of flowers from Mom's gardens and deposited them all around the house. I watched him assert his own designs. My young man-son is coming into his own. God help us give him space when he needs it, offer hugs and a listening ear if even he seems at first to not require them, and to admire as his unique soul begins to emerge out from the nebulous shadows of fear and uncertainty. With Grandma at one of the open houses in Springfield. He's so tall! Playing with Grandpa's battery operated bubble machine in the gazebo. Being tuned. Listen. Sense. Smell. Acknowledge. Notice. Lesson 11 offers an encouragement to be personally aware, which invites you to simultaneously be objectively curious and observant. It's like being Sherlock Holmes with Watson's heart. She says that then we don't have to react. Our first response does not have to be to fight or flight as though the stakes were survival. Mysteriously or not, the load lightens with awareness. And new habits can develop. I'm grateful for my new habit of blogging and mindfulness thanks to this "Year to Clear" course. How was I not free to do it before? The boys get up early and ride the bus to school with a home packed lunch during most of the year. 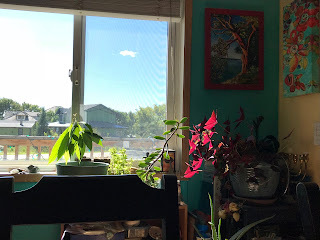 This is summer, and the sun is up early beckoning me to get up and get on with living, even while my growing beautiful boys are still resting soundly with sunlight pouring in their bedroom. They were so striking last night during their talk back after their film premiere. What an interesting opportunity to observe them articulate their process and their joys and challenges and discoveries in making a film with their friends. The storyline of the film was complex, and so were some of the shots. They spent hours and hours together watching how-to videos, discussing the script, the costumes, the locations and sets, the sounds and images. In the talkback they were confident and witty, honest and clear. I got to observe them as a curious outsider, and not worry about how it may reflect on me. Such a joy. Yes, there were some who spoke to me afterwards and complimented me on my obvious good parenting, noting that "these kids are not normal". But you see, I marvel at them too. I'm not sure how they became so dedicated and gifted. I think they see a lot of audacity in Dave and I and in other artists here in Rosebud. Perhaps that gives them the idea that they could succeed at whatever they set their mind to. Well, they are thriving. And a celebratory premiere is the pinnacle of that feeling. From this vantage point, I would have to search back in my mind to uncover all the stresses, the arguments, the hurt feelings, and the anger I witnessed that was also a part of the process. But like the birth of newborn child, all the labour pains have faded. We are so proud of their imagination, cooperation, stick-to-it-tiveness, sense of humour, and ambition. I think this woman who is leading this year long course delights in disappointing. She knows telling her readers to do NOTHING is surprising and exactly what they don't want to do. It feels helpless. She also knows that NOTICING will help. And if we skip that step, no change will occur; we will continue in a habit of doing Nothing and then doing Something just to stop doing nothing. This lesson was terribly brief. She guided us through three questions of awareness of sensations in our bodies and once we noticed them, she had the gall to add: don't do anything to fix or change them. It's like she knew what we were thinking -"once I do this awareness thing, I'll know what to do" and what does she do? She slaps our hand from reaching out to take dessert before the meal is done. Notice... and sit in that. Give the body a chance to adjust itself before asserting a conscious command of action. Such a humble listening posture. I let go of some remainder of breath I had been holding. My belly softens and new air falls in. My breath just slowed and got deeper. Today my boys premiere a 15 minute movie that have laboured on over 2 years. They stayed up until 1:30 this morning setting it up at the theatre and feverishly working last minute changes in colour and sound. They have already informed me at 8:30 this morning that they intend to continue to work through the day leading up to the big night. Reminds me of Peter Jackson and the crew in New Zealand pulling all-nighters. (We're film nerds to watch and re-watch the appendices of the Lord of the Rings and the Hobbit). But my sons are only 14 and a newly minted 17. I couldn't fall into a deep sleep last night until they returned home safely, even though it was a block away. It didn't help that the night before in little old Rosebud, we learned of a car theft. So sad. The innocence of the hamlet preyed upon and my good friend Paul's jeep was the vehicle stolen. A gift from his Uncle. Last night David locked our van in front of our house for the first time in 12 years. There is no guaranteed safe place. But I will continue to live searching for beauty and joy. There is only one sunflower in our garden. An Aslandy carmelly golden russet beauty. It is a volunteer from last year and it is one of my favourite combinations of colour. It stands in a line of 30, but it is the only to have opened to show its face. I am this flower. An early bloomer. Standing alone. Original and strong. Silent and hopeful. Waiting to be noticed? Yes. But whether I am or not does not change my beauty or who I am. I have already weathered two storms. Lesson 9; Clearing is a state of mind. ...And so is just being. "Clearing is not about fixing a problem or reaching for a solution. It is all about how you relate to the experience." and I'm guessing that it is only in the right relation to the experience that you can actually fix a problem or find a solution. Sometimes I just feel better after I get 10 minutes in to mowing the lawn. The routine sets in and I know what to do without being all that conscious and my anxiety starts to settle as I am slowly and surely progressing. There have been some strong winds in the last 24 hours. 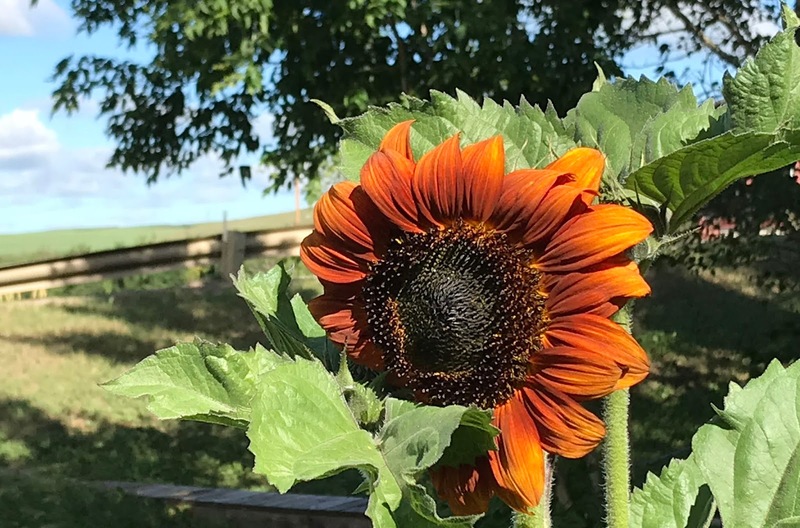 Clouds of billowing dust chase down the highway and the sunflowers bend to the southeast. No hail though. And no big thunderheads. Those are more scary and potentially more devastating. But Davey is grieving his delphiniums as two of the stalks snapped in the gales. Our flowers have been such a bright spot of joy this summer. Even the plants I have indoors that soak up and glow in the sun are bringing me a quiet joy with their endurance and complacency. May I, too, thrive wherever I am planted. Two of these three were transplanted from another home. Today my online instructor says, "awareness changes everything". Because once I am aware of something, whether it be a physical situation, an internal truth, or a universal sense of "something in the air", then it works on me. I can't unsee it. In fact, my conscience and problem solving imagination go to work without even waiting to be asked. There's a problem? My resourcefulness and desire to fix kick in, even while I'm sleeping! The opposite of awareness is what keeps me from action. If I'm not "aware", then I'm not accountable, and I can't float into a fog of no deadlines or responsibility where nothing really gets done except the bare minimum that is necessary. Although I should add that this fog time can be important for dreaming and a stimulus for new ideas. It is often when I'm in new territory that inspiration can be ignited. But even when I am exploring without an express purpose... I am still aware -- tuning, longing for signs and relevance to make peace with my yearning. Lots of thoughts are bubbling up as I embark on this year long clearing journey. I think a lot of change is ahead if I continue to step into the clearer, truer, more wise me -- other things will have to be shed. but it's uncanny how they have come across my path. Now I see that the phrase is to "shed layers by shining light"; that makes so much more sense than "shedding layers by shedding light". Ha. She goes on to speak of the action of clearing being more organic and actually focusing on what not to. She speaks of clutter as having emotional stuckness and a resistance to pattern encoded into it. In other words, clutter in the home is clutter in my mind and emotional life. Things pile up and get ignored and stepped around instead of being sorted and smallened. "soften, bubble up, and release"
A reminder of the slow approach, the 5 S's and the patient work of rewiring instead of reacting. I'm still squirmy and impatient. One of the main areas I have vision to begin is in processing and downsizing my art on my walls. The tricky thing is knowing where to store the art or the empty frames, even art that I may want to save but not put up on my walls right now... where should it live? I had to go do many other things before returning to this page to find it unfinished. Off to a warm sunny summer day. Have you EVER seen black petunias? Me neither... until last Monday. Beautiful velvety darkness -- no longer an oxymoron. But dreams sometimes come from unexpected places.